Sillisculpt sentiment figure by Paula "troubles"
My oh my!! 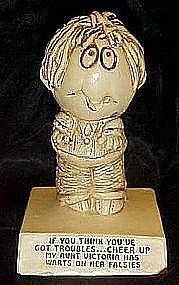 This vintage 1970 sentiment figurine reads, " If you think you've got troubles...cheer up. My Aunt Victoria has warts on her falsies". By Paula and dated 1970. # W-132. Excellent condition, felt bottom.